The history books do not suggest before there was man there was woman but you’d never guess that in Second City’s righteous romp She The People serving up big laughter on Mercer Street this month. When it was reported that Second City would be running a Mainstage Revue in competition to its already playing Mainstage Revue, we were absolutely convinced that someone, somewhere (probably wearing really nice Italian shoes) has flipped their lid. This was a very first as we know it. And we’re just so darn happy they chose to do so in supplementing its programming with sketchy silliness that suggests comedic girl power is alive and well on Mercer Street. It wasn’t the cooling Fall temperatures or the overpowering odour of Nivea Hair Removal Cream that did this to the furiously funny all things feminine troupe. No, it was something far less predictable. 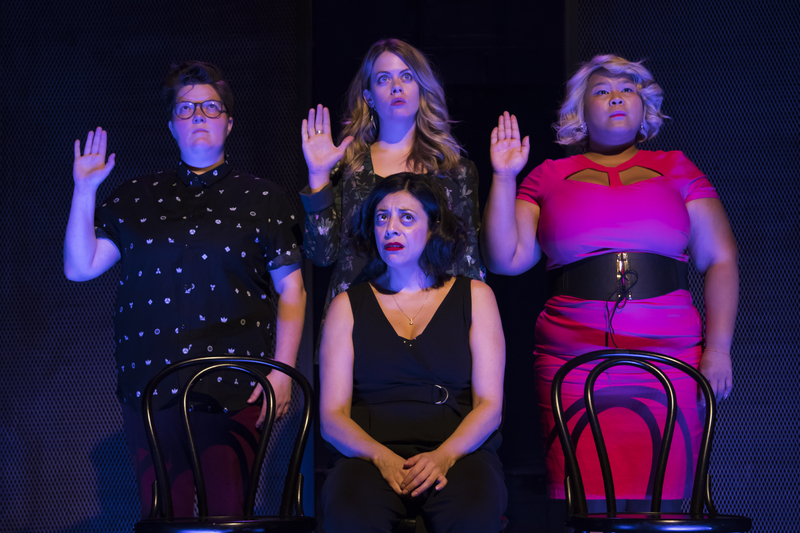 Steeped with endless giggles and sprinkled with oh-no-they-didn’t, this is a show that pays homage to sisterhood of the travelling satire having been first performed in Chicago earlier this year. A texted break-up, an oath of silence, and the hilarious examination of the ‘commercial ladies’ there’s just no end to the stereotypes that bond us all. The bottom line is that we become what we shun in reality of the fact that we are not all created equal, and She The People is a fabulously enriching reminder of such. Refrain from filling your mouth with any kind of beverage during the game show or planned parenting segments unless you want to risk a tsunami of lip spray in all directions when you burst out laughing. And it doesn’t stop there. Birth experiences and a woman’s right to choose a lean cuisine give this estrogen anomaly long, luscious legs of its own. The untouchable Ann Pornell and Paloma Nunez continue to galvanize Revues stunningly well while the superbly skilled Kristen Rasmussen looks and sounds exceptionally silly in her return. For Karen Parker and Tricia Black, this is the perfect performance layer needed to show what Mainstage newcomers can achieve when all the funny fundamentals come together.